It’s time to know the best modern cabinets that you will want to have in your bar or even in your living room. 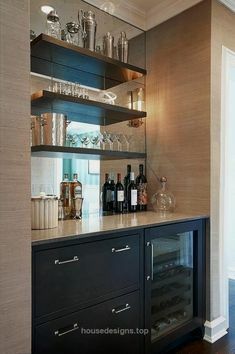 Sometimes the modern cabinets can be the main furniture object in your bar or in your living room, so it’s very important to choose the best one that will match with your home decor. Kelly is a bar stool inspired by the curved and sculpted arches from the bar in the classic movie Casablanca. The body is a full piece of polished brass and features a low back, a foot rail and brown leather on the seat. Besides being stylish, it is made to be comfortable and stand the test of time. We’ll always have Kelly? Inspired by one of the most refined names in the Hollywood industry, Essential Home created Hepburn cabinet. With a body handmade in walnut and two door handles made of polished brass, this mid-century modern cabinet stands out thanks to its leather upholstered applique at the bottom. The mid-century bar cabinet stands on four slender and handmade polished brass legs. Hepburn can be used as a drinks cabinet, sitting well in a modern home bar, or a private country club salon. For an even more unique approach, Hepburn’s many features can be customized to your liking.